Give your inner musician more Voices, more Styles and wireless iPad connectivity for countless hours of digital piano entertainment. 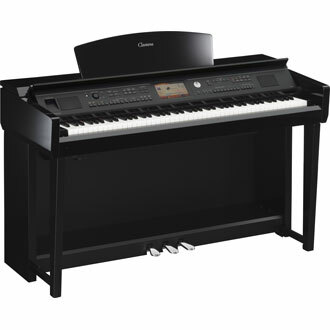 Featuring the Real Grand Expression (RGE) Sound Engine for outstanding playing response and the NWX (Natural Wood X) keyboard with escapement, and with synthetic ivory keytops for classic piano touch, the CVP-705 offers extremely high-quality piano performance. But you'll also get a level of musical fun and interactivity only found on Yamaha CVP Clavinovas. Choose from hundreds of ultra-realistic instrument Voices. Learn to play hit songs with professionally-arranged accompaniment. Plug-in a microphone to sing-along with on-screen lyrics for karaoke fun. Plus, you can add lush harmonies to your singing voice with virtual backup singers. The color touch panel is simple to understand and makes operating a wide selection of functions quick and easy. You can also wirelessly connect your iPhone, iPad or iPod touch to easily share the music you make with friends. With the CVP-705, endless musical fun is always close at hand.